DOOG Stick Family dog toys are safer than a real stick and a whole lot more fun! 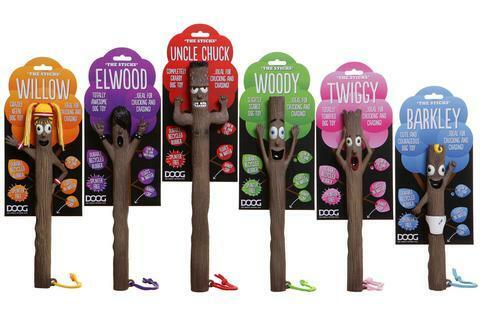 The DOOG Stick family are a safer alternative for your dog to play with and fetch than a real stick. DOOG Sticks are SPLINTER FREE meaning your dog won’t get mouth injuries and chipped teeth like they would fetching a real stick. The Original DOOG Stick Family are made from recycled materials, float in water and have glow in the dark eyes for late night trips to the dog park. Each Stick comes with a built in hand grip and rope for flinging. Barkley is specifically designed for smaller dogs and Uncle Chuck is for larger dogs. Note: These toys are for fetching and play only. Not designed as a chew toy. Please don’t leave your dog unattended to chew this toy and remove when the game is over.